We are proud to introduce The TAN Classics Made Simple - a brand-new companion series to our Best selling TAN Classics collection. 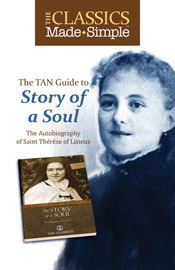 Therese is the author of her own popular autobiography entitled The Story of a Soul, which she began writing in 1895, and she instituted a simple path to holiness now widely known as the "Little Way". She died of tuberculosis on September 30, 1897, at the age of 24 and was canonized only 28 years later, in 1925, by Pope Pius XI. She was later installed as the thirty-third Doctor of the Church by Pope John Paul II in 1997.